Images of Lady Liberty have appeared on American money over the years. Coins have shown her standing tall with a crown on head. She is usually holding a lamp in one hand. And, one thing has remained the same: Lady Liberty has always been white. The United States Mint has released the design for a new $100 gold coin that shows Lady Liberty as a black woman. The special coin is being released to mark the 225th anniversary of the Mint’s coin production. It will be made of 24-karat gold and go on sale April 6. But the $100 coin will not be available to the public; it is meant for coin collectors. 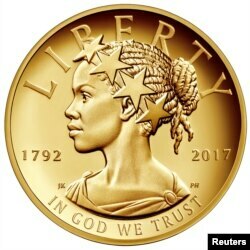 ​The U.S. Mint says this will be the first in a series of gold coins that show Lady Liberty as a non-white woman. Future coins will show her as Asian-American, Hispanic-American and Indian-American. The Mint will release a new coin in the series every two years. Lady Liberty is one of the most powerful and enduring signs of America. Her image represents hope and freedom. People reacted to the announcement on social media. “Lady Liberty” became a trending topic. McCray is married to New York City’s Mayor, Bill de Blasio.